This is the perfect filling for eclairs and profiteroles or just to eat with a spoon. 3 eggs, lightly beaten, plus one egg reserved. Split and scrape the seeds from the vanilla bean and add the seeds and the pods to the milk in a small saucepan. Bring to nearly boiling (when there are little bubbles along the edge of the milk) and then take it off the heat and leave to steep and cool for 30minutes. Add the sugar to the Thermomix and whiz for 10-20 seconds on speed 9. Add the flour and eggs. Put the heat on 90 and speed 4 for 7 minutes. If the consistency isn't right, cook for another minute or two. With 3 eggs it was fine at 7 minutes for me. Cover with cling film touching the custard and cool enough to put in the refrigerator. This is best if you can make it the night before. Place the water, butter, salt and sugar in a small saucepan over medium heat until the butter melts and the water begins to boil. Return to the heat and stir for a couple of minutes, then turn out into a mixing bowl and let it cool for about 5 minutes. Add approximately ⅓ of the beaten eggs to the flour mixture and mix with the wooden spoon. I know it will look weird but keep working it and it will begin to look like batter. Add another ⅓ of the egg and do the same thing. Add the final ⅓ and when it's combined, it's ready to pipe. Place mixture into a piping bag with a large star shape tip and pipe about 3½ inches onto baking paper over a baking sheet. Place in preheated oven and bake for 5 minutes and then reduce heat to 160C / 320F for a further 8 minutes until they are golden brown. Remove from the oven and slice the tops off and put them back into the oven to dry for another 6 minutes. Cool and fill with crème patisserie and serve plain or with chocolate ganache on top. Heat the cream in a small saucepan until it just begins to bubble at the edge of the pan. Add the chopped chocolate and corn syrup and leave it for 4-5 minutes. Then stir until smooth. 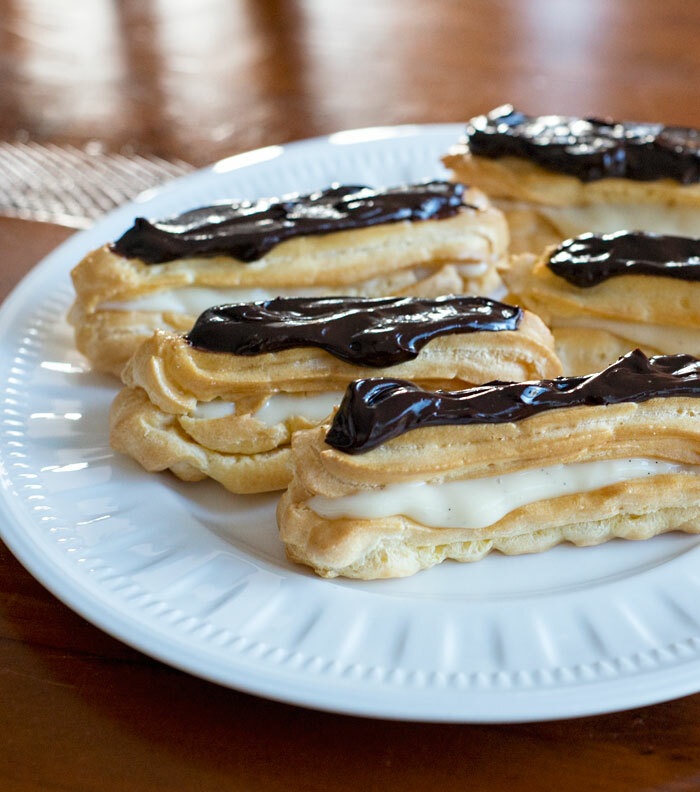 Spoon a small portion over the top of each eclair.